Here you can find solutions to common problems in the operation of the SAM PuttLab software and hardware. 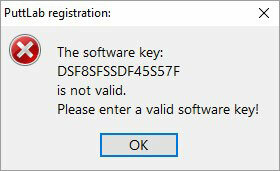 If an error message shows up like the following sample above after entering the software license key there might be different possible reasons for that. To find the cause of the problem please download the “Software key” document and follow the instructions therein. If an error message shows up like the following sample above when trying a measurement with a new laptop, the problem might be the USB port of your new computer. The SAM PuttLab needs the full USB power to initialize the system. Some manufacturers use USB ports with weaker energy performance than other manufacturers. Unplug all other USB devices. Try again. 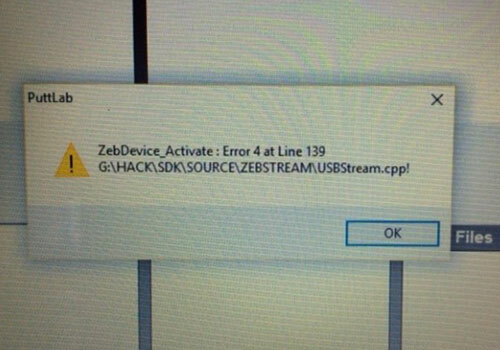 Keep all other USB devices disconnected and try another USB port. Try another USB cable. It is the standard USB cable which comes with every printer. We recommend a high quality cable with max length of 3m/9ft. If no signal is showing up anymore there might be different possible reasons for that. Have you tried the system in another room? Maybe something has been installed in your studio what causes interference with the SAM PuttLab communication between Triplet and BasicUnit? 1. When you have used the system the last time (working)? 2. Do you use a new computer? 3. Has something changed in the environment of the room? If it has worked before and you could answer the question 2 and 3 with no, please download the “SAM PuttLab Problem Analysis” Document and and follow the instructions therein. If the problem analysis showed, that certain parts should be returned for service please download the “SAM Packing and Shipping Guidance” document and follow the instructions therein. In general USB cables longer than 3m/10 feet can cause problems. Most specifications guarantee proper work up to this distance. Additionally there is a dependence on the computer you use. For some models long cables work, for others they do not. SAM PuttLab is powered by USB, so the power the USB port delivers through the cable must be sufficient to drive the PuttLab unit. At the same time communication is running and needs to be stable all the time. We have active USB extension cables available in 5m/15ft and 10m/30ft. The 15ft cable should do the job in most of the cases. Together with the original 3m cable you get a total distance of 8m/25ft. You can order the cable extensions from us directly or we can do recommendations for buying in the USA. The Price of the extensions is not critical, if we ship from Germany to countries outside the EU the international shipping cost will be the biggest part. We would estimate a total cost of $90 with UPS shipping. We only can guarantee function for cables we know as we cannot test all different extensions out there in the market. Besides active extension cables there is another option to get longer distance. You can use a powered USB hub if you have power somewhere close to the PuttLab unit. Then the power comes from the hub and the long USB cable just needs to do the communication transfer. If you have a USB hub available you may try this. PuttLab 5 allows users to remote control the PC software with the PuttLab App on smartphones or tablet computers. The iOS app offers direct remote control of the most important functions of SAM PuttLab: System calibration, starting measurements or training sessions, and opening the results reports. Click here for more information and videos about the PuttLab 5 App. If you have any problems with the connection process between the iPad/iPhone to your PC/Laptop please download the “SAM PuttLab 5 App Installation Guide” and follow the instructions therein. For more information about the Features in detail follow the Link above and watch our SAM PuttLab 5 App tutorial video. Please Download “SAM Packing and shipping guidance” and follow the instructions therein.